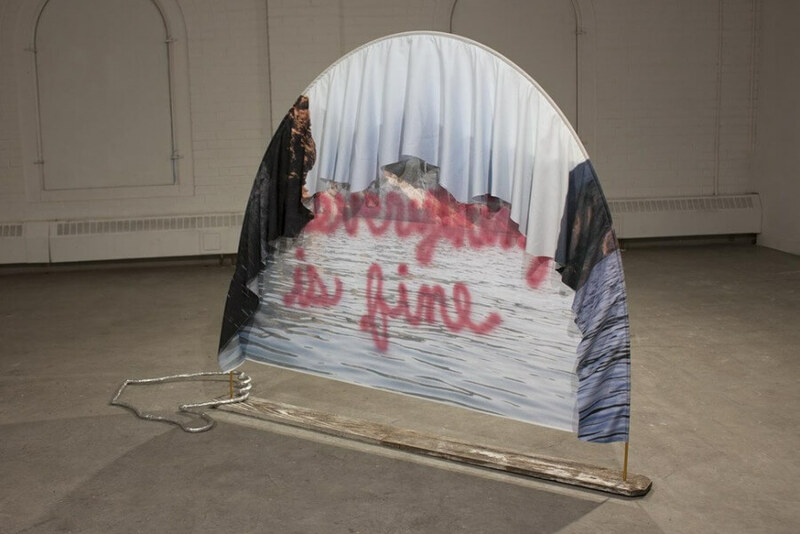 Morgan Rose Free is an emerging Canadian artist predominantly working in sculptural assemblage and installation. 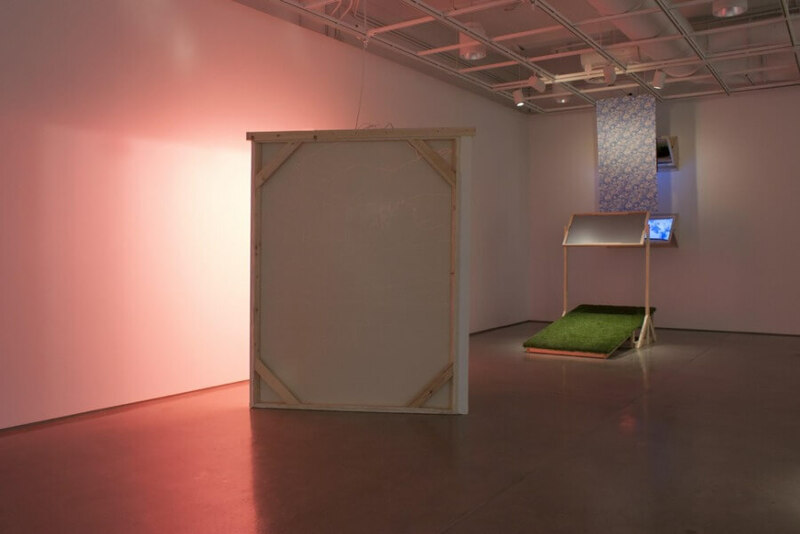 She has exhibited in the U.S and across Canada including Calgary, Toronto, Montreal, Baltimore and New York, with an upcoming exhibition at ACRE Projects in Chicago. She held the position of Adjunct Professor of Sculpture and Freshman Foundations at Alfred University for the 2017 academic year and recently relocated to Montreal, QC. I was born in Calgary, Alberta, where I went to the Alberta College of Art and Design for a BFA in Fibre (excuse my Canadian spelling), after which I worked within Calgary’s public school system as a Studio Artist in Residence for three years. In 2015 I drove across Canada and entered the state of New York for graduate school at Alfred University, where I majored in Sculpture. I then stayed on for an additional year as an adjunct professor teaching Freshman and Sophomore sculpture. About a month ago I relocated to Montreal, Quebec where I’m slowly starting to make new work. My work is a lot of things. I often use wood, found objects and fibre techniques. I alternate between making free-standing sculptures or wallworks, and interactive installations. It’s often dependent on my studio space or exhibition opportunity. If I want to make an installation, I need to find the right opportunity and space to tailor it to. It’s important for me to pursue different avenues in my practice as I find it boring to make the same kind of work all the time. Having just moved to Montreal, I’m still settling in and figuring out how to make my home studio work for me. I’ve just started experimenting with smaller wallworks which I hope will begin to operate as a series. I’ve been dying fabric and collaging through machine and hand sewing. Right now I’m mostly playing and keeping an open mind. I have some exciting things coming up in the next few months. I’m collaborating with artist Aaron Moran to make a couple of zines for his publication project POOR QUALITY which will be exhibited at the Vancouver Art Book Fair in October, and in November I’m in a group show in Chicago at ACRE Projects. I’ll be at Bunker Projects in Pittsburgh from December to March which I’m really looking forward to. The residency concludes with a solo show, so I’ll be spending four months creating a site-specific installation. After Pittsburgh I’ll be heading to Vermont Studio Center for four weeks. It’s opportunities like these residencies that allow me to create larger interactive work. Describing my practice to a stranger can be challenging because I find it hard to define my practice in just one way. I’ll usually say that I mostly work in sculpture and assemblage; using found objects, wood, and fibre techniques. Content wise I’m interested in how we as a culture interact with or understand the natural world in relation to daily life. 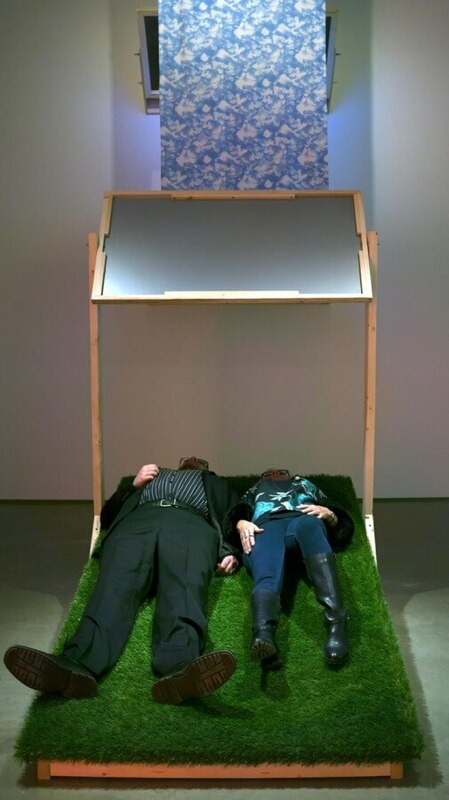 When I talk about my installation work I describe it as trying to recreate a memory or experience within nature. I start with something that is directly tied to personal experiences, both intimate and cultural, and reconstruct it to be experienced in a new way. I’m interested in the ways we can suspend our disbelief in a constructed environment and connect with specific memories and places. 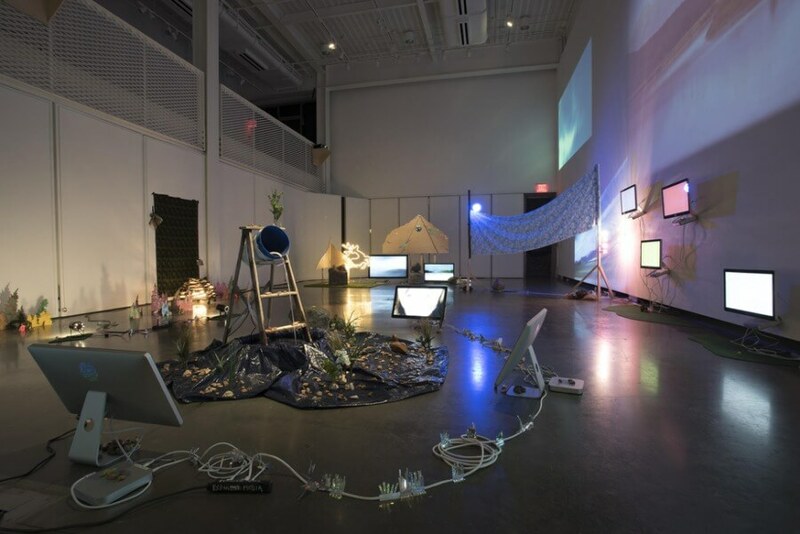 Your website discusses the cross disciplinary and collaborative nature that your work can take (specifically between video and sculpture), can you elaborate on this approach to art-making? 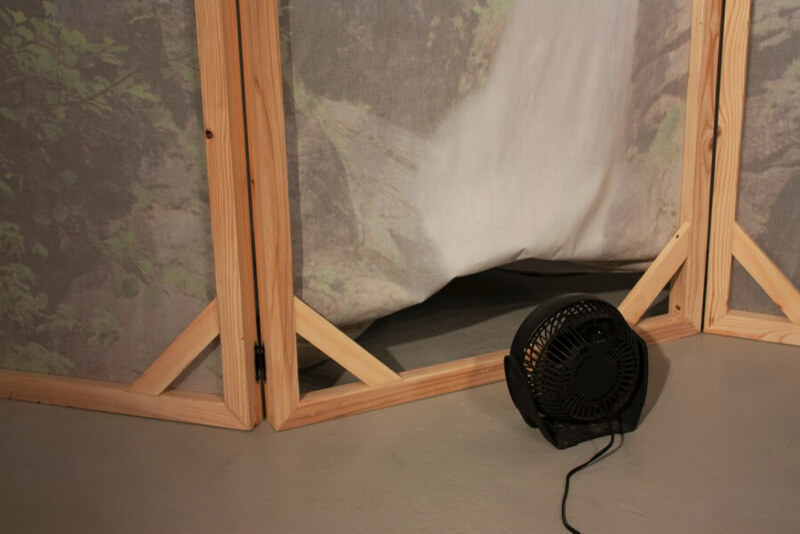 I have a collaborative practice with video/sound artist Jessica Earle. We went to graduate school together but majored in different disciplines. Jessica was in the Electronic Integrated Art department (EIA) while I majored in Sculpture. We found that our departments approached our work through the very specific lenses of our respective mediums. Although we are lay-people in each others disciplines, we are generally drawn to similar conceptual concerns so it was interesting for us to have studio visits and see how we responded to each other’s work. 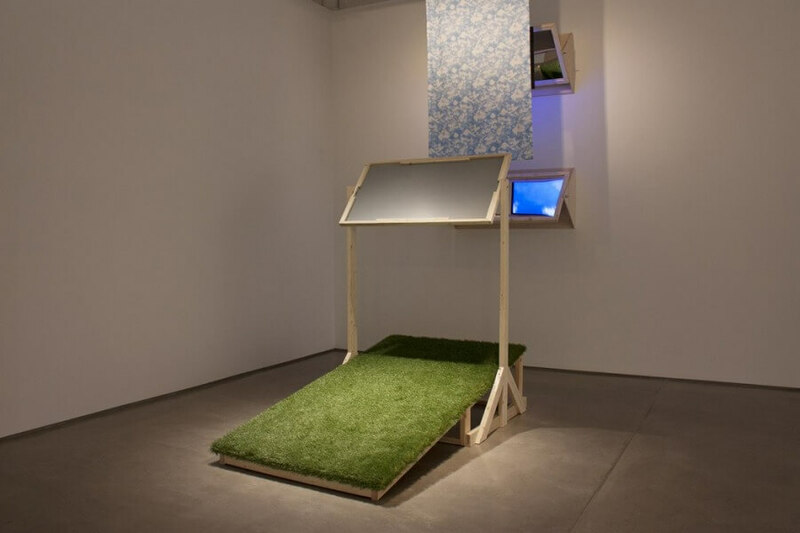 While I’m not particularly video savvy, Jessica thrives in a two-dimensional screen based world, and while I work through building physical space, she creates through projecting it. We decided we wanted to bring those worlds together and bridge the gaps in each of our practices. So far we’ve had two collaborative exhibitions, both of which have resulted in large installations. We work off of each other when we collaborate, almost like musicians in a jam session. I’ll make a structure to frame a screen or be projection mapped onto, and her video and sound work will influence the structures I build, and vise-versa. One of the biggest (and most fun) challenges of our collaborative practice is lighting. We aim to abolish any sort of hierarchy of material so we have to figure out ways to make spaces that are dark enough for projections but still light enough for the sculpture to be viewable. In your eyes, what can sculpture do as a medium that other mediums might not be able to? As we spend more and more time staring at screens, we are living in a rapidly more two dimensional world and it’s getting easier to not feel the need to leave the house. We all know most art these days is viewed online, and documentation can become the most important part of making for a lot of artists. Viewing work through photographs is so common place that it’s easy to focus on the documentation of a piece or a show during the making process. I find myself fighting against that all the time to focus on how the work will be experienced in person. To me the really special thing about sculpture is that it forces you to deal with physical space. Not just as a maker but as a viewer. 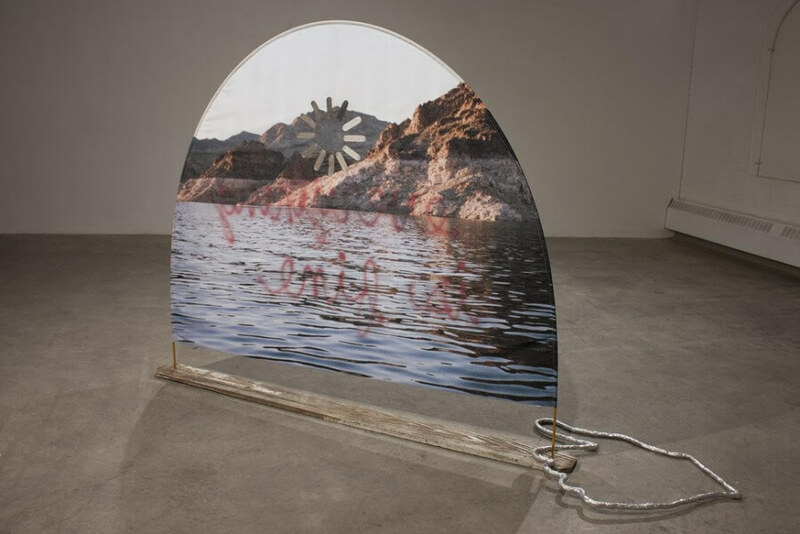 Sculptural works often beg to be experienced and elude documentation. I think having a physical encounter with an artwork can be a magical and profound experience, especially for people who don’t normally engage with art. Sculpture forces us to connect with the world irl and I think that’s v important rn. Rafael Lozano-Hemmer’s Unstable Presence at the Musée d’art Contemporain de Montréal! The whole exhibition was a series of interactive installations. Much of it was through video and sound while still having many analog and physical elements. I really wish my collaborator was with me because it was so great to see how physical experience and technology supported each other and made the viewer become a part of the work rather than just looking at it. Lozano-Hemmer is a great example of an artist whose work defies and eludes documentation and is designed solely for physical experience. Many artists collect things whether they realize it or not, what do you collect? I collect a lot of unwanted things. Wood scraps is a big one, often woodshop cut-offs or construction site remnants, old fence posts left in alleys, branches fallen from trees. I also like strange fabric scraps or pieces of furniture like chair and table legs. Living in Alfred, NY was very conducive to this as it is a very rural community full of weird junk stores and yard sales. Some collected objects come into my work pretty quickly while others will be around for years. I try not to hoard too bad and get rid of things fairly regularly, but usually right after I throw something out then I think of something to do with it! Now that I’m in Montreal I’m very drawn to construction sites. Montreal is full of construction in the summertime and there are signs, rebar, wood and traffic cones everywhere. I’m so far resisting stealing things and just taking photographs. My current studio is between my bedroom floor and a desk in the living room. My roommate does drawings, zines and tattooing so we have half the living room as a shared studio space, and I can spread out a bit more in my bedroom. I’ve been spending the last few weeks figuring out how to make a home studio work for me which has been a bit of a challenge. I’ve been very fortunate to always have a studio and access to a woodshop, so now I’ve been trying to work smaller and in new ways. Storage has been on my mind more lately than anything else. I have a storage unit in Alfred where I’m keeping everything I have made in the last three years, and now that I’m in a new city with a different set of resources I’m reluctant to go too big. However, I have five months of residencies coming up this winter where I am excited to make large work again and reinvigorate the installation side of my practice! Is there a specific material you find yourself always going back to? I’m aesthetically drawn to the raw lumber of construction, simple pine boards like the frame of a house. I don’t often engage in clean and beautiful joinery, I like to screw things together. I usually ask myself what the simplest way to get a thing to function would be and go with that. I like to be transparent in my construction, I think there is an honesty about that and I also think it’s sort of funny. Maybe funny isn’t the right word, maybe cheeky or sassy. It makes me think of the kind of cheap junk we buy instead of investing in really well made things, and in that way I’m sort of poking at consumer culture. But I’m also thinking about how most of us really don’t know how anything we use in our daily lives is built, and I want people to be able to figure out my work in that way. I also use wood in various forms of its natural state; logs, branches, sometimes living plants. Textiles always enter my work. I love being able to move between working large with power tools and heavy materials, and working quietly and meticulously, embroidering or sewing. Embroidery is particularly meditative for me. I am not only just drawn to the personal process of working with textiles, but I think the rigorous handmade aesthetic of something that’s been clearly done by hand slowly over time adds another layer of honesty to my work. Your work seems to deal with notions of ‘natural’ vs. ‘manufactured.’ Can you elaborate on this interest? I started working with wood a lot in undergrad and I became initially interested in questions like when does wood become synthetic? Is it when it’s over processed into plywood or chipboard or is it simply when its not longer recognizable as a tree? Does it happen the moment the tree is cut down or does it only happen when it’s built into something else? So I started to think about everything around me in that way, when does a thing become manufactured, man-made or synthetic? Everything we have comes from the earth and is derived from the periodic table of elements that exist on this planet so when do we choose to make these distinctions? In investigating these questions in my work more questions would come up and many began to change over time. I started to think more about material culture and consumerism, and the value and meaning we place on objects; both natural and manufactured. The cultural constructs which define what is organic and natural and wild are complicated and mostly in flux. Allowing myself to approach these questions in many different ways excites me and keeps feeding my practice.